Through the efforts of countless artists, George Washington's home was also familiar in national and international circles even before the advent of photography. This early view of Mount Vernon showing horsemanship and hospitality was painted by Italian artist, G. Ferrario. P. Fumagalli created the aquatint, circa 1816, from Ferrario's original artwork. This print resides in the collections of the Mount Vernon Ladies' Association with over 1,000 "early views" of the Mansion. This ornament is on fine porcelain in a setting of 24-karat gold-finished brass. 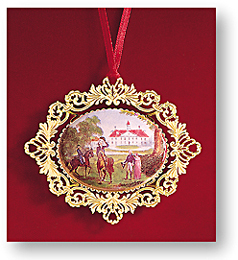 Engraved Christmas 1996 on the back with the words: Mount Vernon Circa 1816, adapted from a hand-tinted engraving by P.Fumagalli.